The Ibanez RG-PB-TOM turns heads immediately with its angled singlecoil in the middle. In close collaboration with Meinl’s guitar repair guru Wolfgang Payerl, German guitarist Tom Riepl spec’d the instrument carefully in 1999, choosing an RG shape with a highly-figured Tiger Stripe Maple top and a Mahagony body, a j.custom neck with Rosewood fretboard and a slightly chunkier profile compared to the regular Wizard necks, only three dots at the 12th fret as markers and Tom’s name inlayed on the 24th fret. Pickup-wise Tom went for a unique HSH-configuration of DiMarzios, with a Tone Zone humbucker on the bridge, an angled Class of ‘55 singlecoil in the middle, and a Classic PAF humbucker in the neck position. The singlecoil was angled that way in order to provide Tom a bit more “twang“ on the low strings and a warmer sound on the treble strings (pretty much the direct opposite to the default position of the bridge pickup of Strats). 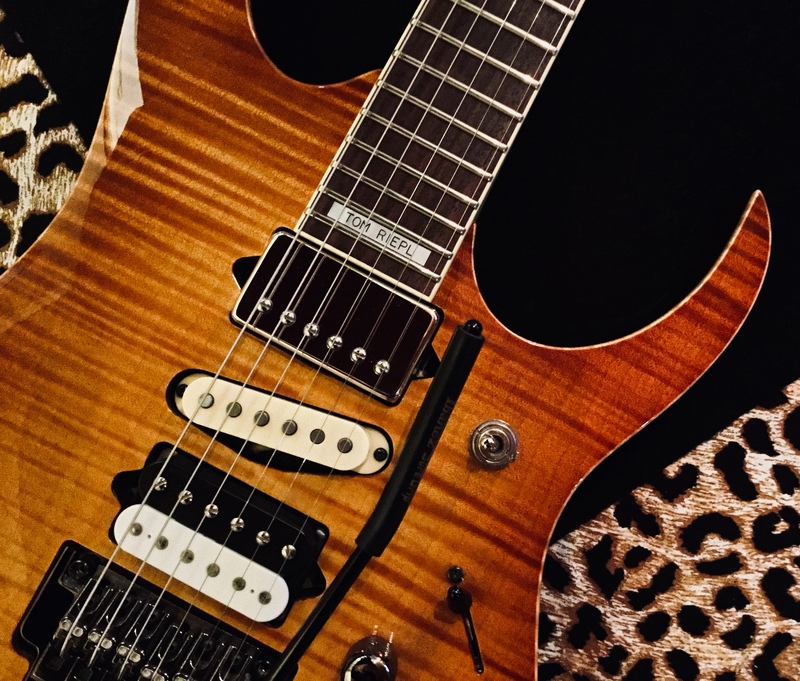 Icing on the cake of this unique model was the use of the new Piezo-equipped Double Lo Pro Edge tremolo that Hoshino had developed at that time and a complex switching system with, making it a super versatile instrument.